A multi-disciplined artist, Oryst Sawchuk defies simple classification. He is an architect, a graphic designer, a painter, a sculptor and a musician, as well as an urban planner, and a business and community leader. His artistic expression is rooted in social consciousness. Sawchuk won a Community Builders Award for Arts in 2010. “Ever since my days as a student at the School of Architecture at the University of Manitoba, I’ve been under the influence of the modernist architectural movement of the 1920s and 1930s, which was not just a revolution in style but had social ambitions to enhance the conditions under which ordinary people lived,” says Sawchuk, the son of Ukrainian immigrants. As senior partner of Sawchuk Peach Associates Architects Planners, his architectural contributions to the city include the original Grace Hartman Amphitheatre at Bell Park (demolished in 2009), the Sudbury Transit Centre, the main fire hall in downtown Sudbury, Lo- Ellen Park Secondary School, the N’Swakamok Native Friendship Centre, and Market Square. Graphic art and sculpture are a natural extension of his architecture. Sawchuk captures Sudbury’s proud history through the mediums of pen, ink and watercolour. He has created a legacy of heritage drawings and paintings that capture the spirit of determination upon which this city was built. His sketches for Northern Life delighted readers for more than a decade. In 1998, he contributed 15 pen and ink sketches to Street Names of Downtown Sudbury, a heritage book published by Sudbury’s Your Scrivener Press. In the mid-1990s, he established the Acorn Gallery on Oak (Sudbury’s AGO), where he can often be found encouraging young artists to explore their own talent and artistic expression. The gallery is a popular stop on the annual artists’ studio tour. While contributing to the urban landscape of the city, Sawchuk has also worked diligently to champion the preservation and restoration of heritage buildings as monuments to Sudbury’s history. He is chair of Greater Sudbury’s Heritage Advisory Committee as well as a member of the city’s archives committee. 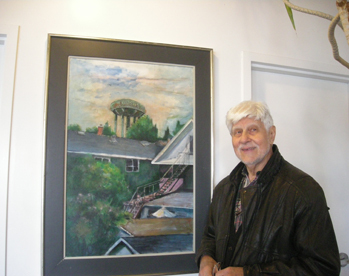 In 2008, as part of Greater Sudbury’s 125th anniversary celebrations, Sawchuk hosted two exhibitions of his drawings of heritage buildings—many of which no longer exist except in our collective memory. As an artist and as a volunteer, Sawchuk has, over the years, been a contributor of his time and talent to the Sudbury Arts Council, the Art Gallery of Sudbury and the Sudbury Theatre Centre. He created the original logo for the Sudbury Theatre Centre. A former president of the Sudbury Chamber of Commerce, Sawchuk was active in the business organization for many years, and was an early lobbyist for the four-laning of the Trans-Canada Highway. As a member of the chamber’s arts committee, he was instrumental in the installation of the Spirit of ‘86 sculpture, which stands next to the Sudbury Theatre Centre. True to his Ukrainian heritage, he has been president of the Association of United Ukrainian Canadians, Sudbury branch, for more than a decade, and has represented Sudbury at national gatherings in Toronto, Winnipeg and Edmonton. With his guidance and encouragement, the association has produced many musical and theatrical events including the most recent, Four Poets Who Changed the World (Jan. 31). Sawchuk has performed in community bands since the 1940s, playing the mandolin and trombone. Since 1994, he has conducted the Jubilee Folk Ensemble. In this role, he has devoted himself to helping promote and foster community pride in the fabric of Sudbury’s multi-cultural heritage. The ensemble is invited to play for numerous community groups. In 2005, he conducted for the Tsunami RX Benefit Concert, and in 2007, was conductor when the Jubilee Folk Ensemble entertained thousands during Canada Day celebrations at the Sudbury Arena. Sawchuk’s focus on keeping the heritage and culture of this city alive and well is reflected in his architectural designs, paintings, sculptures, music and community spirit.